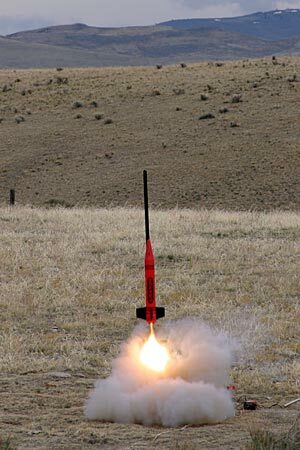 This is a scratch-built rocket using a Crayon® bank. I put in a 54mm motor mount with two plywood centering rings. I used an Aero Pack motor retainer for motor retention, and a ROCKETMAN R4C parachute. 1) 3/27/04 I218-10R Nice flight. AltAcc 2C reported 2,028 feet, 16.1 Gs, and 312 max mph. 2) 4/24/04 J275-10W Nice flight. 3) 5/15/04 I218-10R Nice flight. AltAcc 2C reported 2,224 feet, 16.0 Gs, and 309 max mph. The Crayon rocket on a J275-10W. 4/24/04.